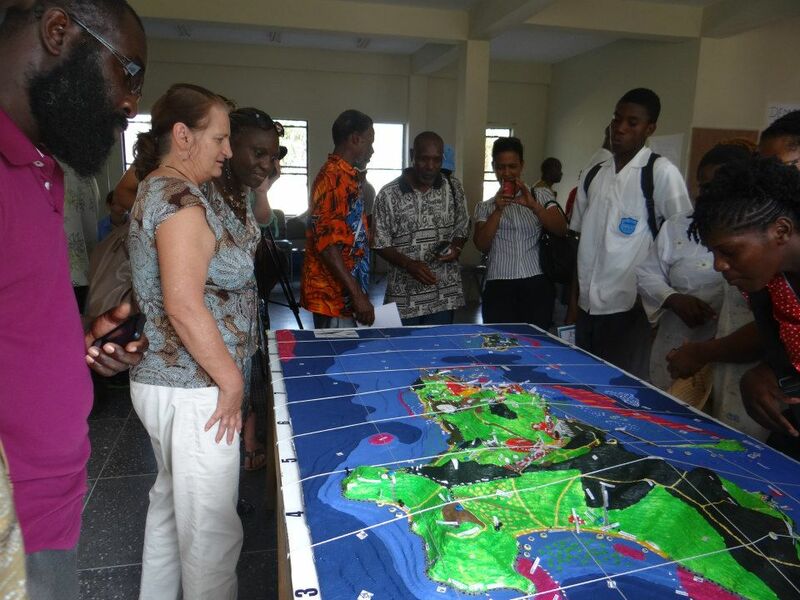 In 2013 the civil society organisation Sustainable Grenadines Inc. (SusGren), with support from The Nature Conservancy (TNC), the Technical Centre for Agricultural and Rural Cooperation ACP-EU (CTA), and The Grenada Fund for Conservation (GFC), organized a P3DM workshop on Union Island in the Grenadines. The exercise took place over the course of nine days, from February 28th to March 8th, 2013, in the Ashton Resource Centre, in the town of Ashton, Union Island and was attended by more than 100 residents. The workshop tookplace in the framework of the wider At the Water’s Edge project and was a result of 5 months of planning and preparation, including several preliminary meetings with stakeholders and community leaders, as well as two community mobililsation events in the towns of Ashton and Clifton. The District Office on Union Island has been a major partner in the project and represented the community of Union Island. Their head office the island’s Revenue Office building now houses the completed model. Stakeholders from the Caribbean Region attended the event as well. These included representatives from the Caribbean Climate Change Community Centre (5 C’s), Grenada Fund for Conservation, Grenada Red Cross, the Union FisherFolk Organisation (UIFFO) and others. The objective of the P3DM exercise was to raise awareness on the need to restore the status of a vast lagoon which had been subject of a failed development which resulted in profoundly altering existing ecosystems. In fact, in 1994, a foreign developer obtained permission to build a 300-berth marina in the central section of the Ashton Lagoon. The plans included a causeway connecting Frigate Island to Union Island, a recreation centre on Frigate Island, a large condominium complex built on the outer reefs and a 50-acre golf course to be laid over the mangrove. What the plans failed to take into account was the destruction that would be caused to the land and seascapes. Before the building started, Ashton Lagoon had been the last remaining pristine lagoon in St. Vincent and the Grenadines. 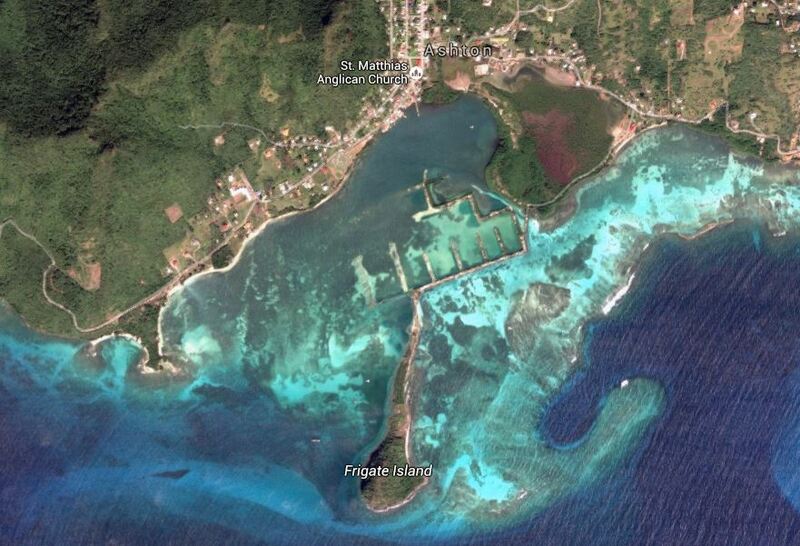 Located on the south coast of Union Island, the site was unique: it contained all the primary components of a lagoon and coral reef ecosystem, including a long stretch of outer reefs, a shallow, protected inner lagoon, abundant seagrass beds and the largest area of mangrove forest in the country. All four species of mangrove present in the region were found here until the construction vehicles moved in to start tearing them down. Unfortunately the marina complex was never finished. In mid-1995, the construction company declared bankruptcy and the project was abandoned. But the damage already done was incalculable. During construction, the lagoon was dredged and a road was built around the mangrove. A causeway built between Union Island and Frigate Island prevented water from circulating into the western half of the bay and the remaining water became stagnant and turbid. The seagrass beds, lobster, conch and many fish disappeared and corals died or became overgrown with algae. The restricted flow of seawater caused the mangroves to become severely stunted, and the salt ponds almost dried out. Victory finally came on January 7, 2015, when the Government of St. Vincent and the Grenadines gave approval for restoration work to begin in Ashton Lagoon. The decision was issued through Cabinet note ARTFF, a document that now holds the key to SusGren’s dogged campaign. Based on an impact assessment conducted by CTA in 2015 the Union Island model made a significant contribution to plans to restore the Ashton Lagoon, as the model building exercise catalysed previously stalled efforts to gain official approval for commencement of restoration works. In November 2015 the Ashton Lagoon Restoration Project was officially launched.